(female narrator) A sunny Friday afternoon in May on the campus of the University of California, San Diego. Spring is in the air, and hormone levels are soaring as the competition to attract mates reaches a high point. Loud mating calls and flamboyant displays are frequent. Breeding season is an exciting time. But it can be stressful too. This rambunctious atmosphere is a far cry from the peaceful forests where juncos typically breed, especially during the school's celebration of the annual Sun God Festival. But for a select group of juncos, this radically different habitat is their year-round home. Juncos are not thought of as city birds, so their recent adaptation to the bustling campus is a surprising turn of events. 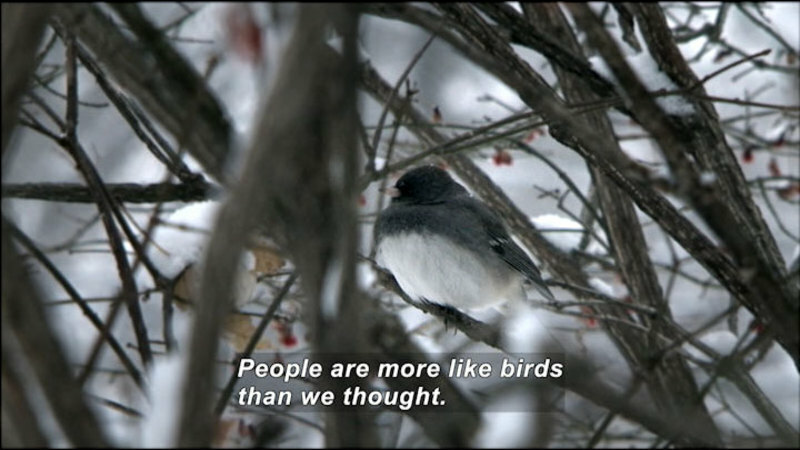 But to fully appreciate what makes these juncos unique, one must first understand the population's roots. Just 60 miles east of the city of San Diego, a population of juncos breeds on Mount Laguna, representing the southern edge of the Oregon junco breeding range. The subspecies junco hyemalis thurberi breeds in a forest environment, similar to places like the Tetons and the Black Hills. It is an oak and pine covered mountain rising from the desert to an elevation of nearly 6,000 feet above sea level. Southern California has a huge variation in topography from sea level to over 11,000 feet. Historically, with the coniferous forest only over about 4,000 feet elevation, that was the only area where the junco was known to breed. (narrator) But even at this lower latitude, winter in the mountains can be cold, snowy, and windy. So most juncos that breed on mountains, such as Mount Laguna, migrate to lower elevations, including coastal areas, during the winter. When breeding season approaches, the migrate back to the mountains. That is, until the early 1980s, when some Oregon juncos did not return to the mountains in the spring. Instead, staying to breed along the coast on the campus of the University of California, San Diego, a colonization event in which the juncos became isolated in a whole new world, not unlike the first arrivals on the Mayflower. The UCSD campus here is situated right on the coast. So we're a few hundred feet off of sea level up on the coastal bluff. But it's really part of the greater city of San Diego. It's surrounded by residential neighborhoods, urban settings, commercial areas. It's a college campus. Classes go on during the week. There's all kinds of vehicle traffic, human traffic, pets, noise, light. It's very much a bustling, urban-suburban kind of setting. (narrator) Founded in the 1960s, UC San Diego has grown to an enrollment of more than 29,000 students. The campus is known for its unique architecture and modern art, including several installations inspired by the works of local resident and philanthropist Theodore Geisel, who is better known to the world as Dr. Seuss. 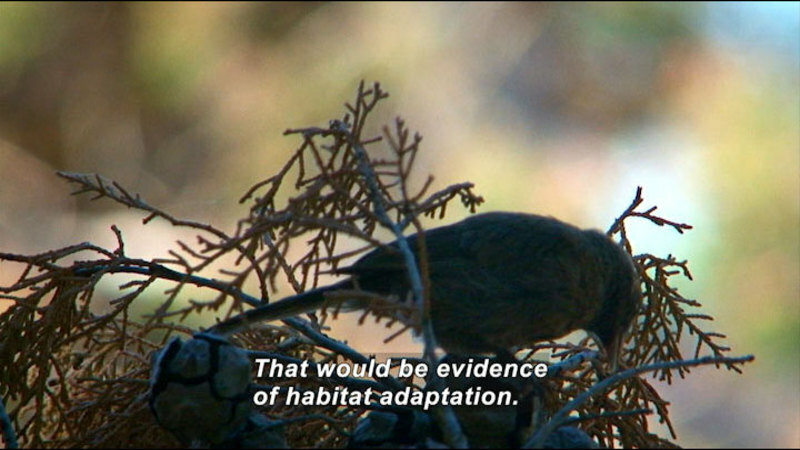 (male) In thinking about the history of the colonization of the junco at UCSD, first thing to remember is that it's not a terribly old campus. When was it first built? In the 1960s. Previous to that, it was sage scrub, chaparral, just like the rest of the city of San Diego. We can go back only so far before it would have been completely unsuitable for juncos breeding. The first known sighting of them came in 1983. And that was, I believe, from Stan Walens. He's been a very avid birder for many years. It's not the kind of thing he would have overlooked. (Walens) When we moved here, I was already hooked on birding. Every day I would go birding on campus for an hour or two. And I wandered everywhere through the entire campus for the entire eight years that I was here. It happens that I was taking care of my young daughter then. She said, "Look, Dad, there's some juncos." I said, "Rachel, juncos are here in the winter, it's July." She said, "No, Dad, they're juncos." Then she pointed to two little birds underneath the bush. 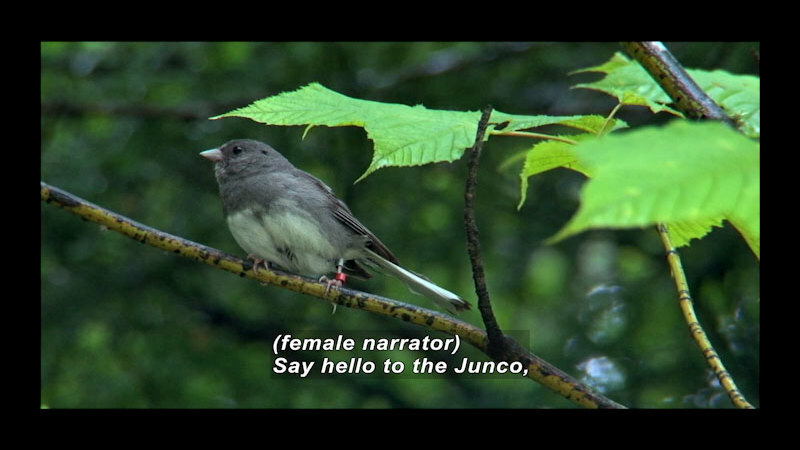 There was a male and female junco. She was this tall and saw the juncos down there. She was proud she could better see birds than her father. (narrator) The colonist population grew from an initial flock to a small but stable size of about 80 breeding pairs. Isolated from their native breeding range by a sea of unsuitable breeding habitat, the population exists as a biogeographic island. It wasn't long before the unique situation caught the attention of scientists, including then UCSD biology professor Trevor Price. It's obvious why juncos decided to stay here. They came down here from the mountains, deeply covered in snow. They took one look at me drinking a cappuccino and said, "This is a good deal, I'm gonna stay." 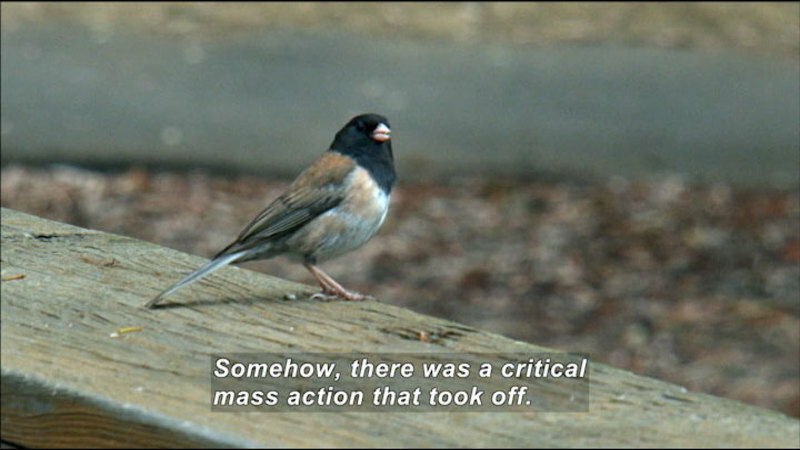 What probably happened was the birds themselves were singing, getting ready to leave, and enough males were singing to stimulate the females enough to start building nests. Somehow, there was a critical mass action that took off. (narrator) Animals around the world have been adapting to changing environments for millions of years. But recent decades have seen unprecedented rates of habitat alteration and climate change. Some species respond successfully, while others go extinct. Seeing these juncos show up and adapt in such a short time span has allowed scientists a unique opportunity to study what biological traits have changed to make this transition possible. (Price) When you look at the birds, you find that they've managed to change, in response to both the pressures of living in a city and the different climate. One of the features of the mild San Diego climate is that the birds themselves stay in San Diego year round. If you live in the mountains, you leave the mountains and come back. (narrator) The juncos living here must do so in harmony with a landscape of natural and man-made components. The new habitat presents countless challenges and novel threats-- vehicles, humans, and urban nest predators, such as cats and crows. Noise is constant, and artificial light illuminates the night. But there are opportunities. Not the least of which is the mild climate. Large lawns and ornamental plants at UCSD are watered and cared for year round, providing consistent sources of seed and insect nourishment. Decorative fountains provide limitless drinking and bathing opportunities. Food crumbs and garbage from the dozens of cafés and picnic spots provide additional foraging options. Starting in 1998, UCSD graduate student Pamela Yeh led a team of student researchers that first studied the campus juncos intensively, capturing, color banding, and following each and every individual junco in the population for nearly six years. The research continues today, with teams from both Indiana University and the University of Chicago collaborating on recent studies. Compared to working in remote locations, field research on campus can be more convenient, but also has its fair share of awkward moments and difficulties. Among the most striking changes that Yeh's team first documented, was a shift in the timing and duration of the breeding season. On Mount Laguna, cold winters and hot summers restrict junco breeding from May to early June, with a single brood of offspring each season. At UCSD, however, junco's start nesting in February and continue well into August, raising up to four broods. This dramatic adjustment of breeding schedule has had cascading effects on many other traits. This tendency to stay all year round and to have multiple families each year, seems to have led to a suite of characters that make males much more interested in raising young than they do in chasing after mates. We found the males are less aggressive to each other. Both the males and females have less white in their tail. White is used in an aggressive display. Their heads have less black, which is another signal of aggressive displays. 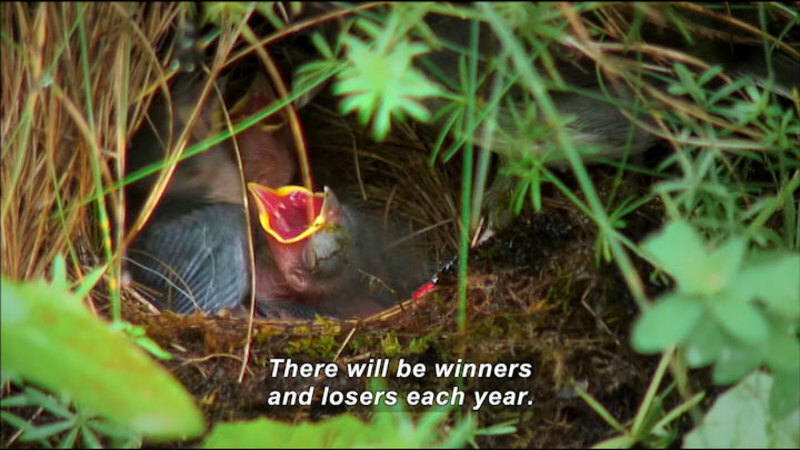 The males are better parents at the nest, as was shown by Jonathan Atwell. Many characteristics have evolved in response to the longer breeding season. On top of that, we've got changes that have happened in response to the urban environment. People that study animal behavior will talk about how bold or how shy individual animals or populations of animals might be compared to others. The juncos here at UCSD are very bold, both in terms of how close they'll allow people to get to them-- they're very tame or bold, but also in their willingness to approach novel objects or enter into new situations to potentially explore food resources or breeding habitats that they have not encountered before. (narrator) When researchers actually quantified just how bold campus juncos have become, they found that they allowed people to approach three times closer than birds on the mountain. They were twice as fast and extensive in exploring novel situations. Blood samples revealed that campus juncos also keep their stress hormones lower during dangerous situations, likely allowing them to cope with the more chaotic and complex environment found in the city. Even the way that campus juncos communicate with one another is altered. Males sing at a higher pitch, a shift that allows their songs to be heard above constant hum of low-frequency traffic noise. Altogether, research has revealed a long list of changes in the biology of the UCSD juncos when compared to Mount Laguna. These differences include physical characteristics, behaviors, and physiological traits. But an important question remained: were these differences induced by growing up and living in the new environment? Or were they due to genetic differences between the colonists at UCSD and the ancestral range population at Mount Laguna? This question is similar to the nature versus nurture topic often debated in humans. 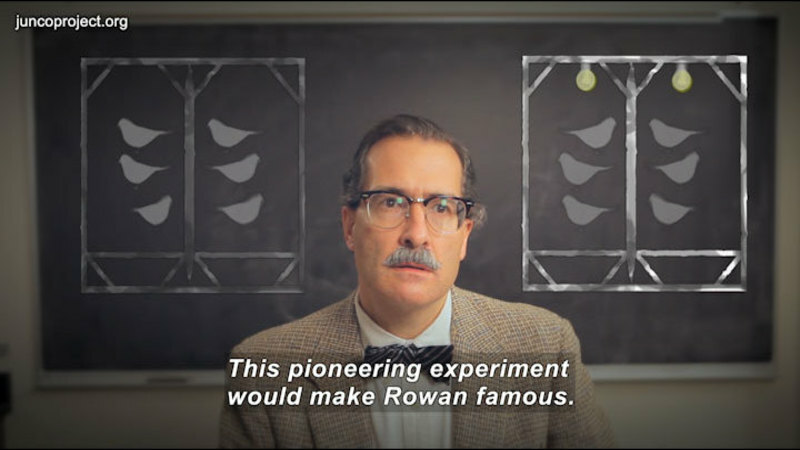 But in plants and animals, scientists can more directly test this question of the relative importance of genes versus environment by using what's called a common garden experiment. By transporting plant seeds or young animals from two different locations into a common environment, researchers can raise them under identical conditions and ask which differences persist and which do not. If differences persist, it provides strong evidence for genetic divergence. If differences disappear, then they were likely induced by the different environments. Researchers conducted common garden studies with the juncos from UCSD and Mount Laguna. Nestlings and juveniles were captured from both populations, and the young birds were transported to an aviary. For more than three years, birds were raised under identical environmental conditions, and many traits were measured as in the field studies. The results were remarkable. Many of the differences persisted. Tail white, head black, and wing lengths were still different, despite the the common environmental conditions, including identical diet, temperature, and day length. Juncos taken from campus were still bolder and more exploratory, and they had lower stress hormone levels, even after identical exposure to human activity and other possible stressors. And the males still sang at higher frequencies, even without differences in background noise. These studies, along with additional genetic analyses, provide evidence that the juncos on campus evolved rapidly over the course of less than 30 years. The campus juncos join a handful of other examples that highlight an emerging scientific realization. 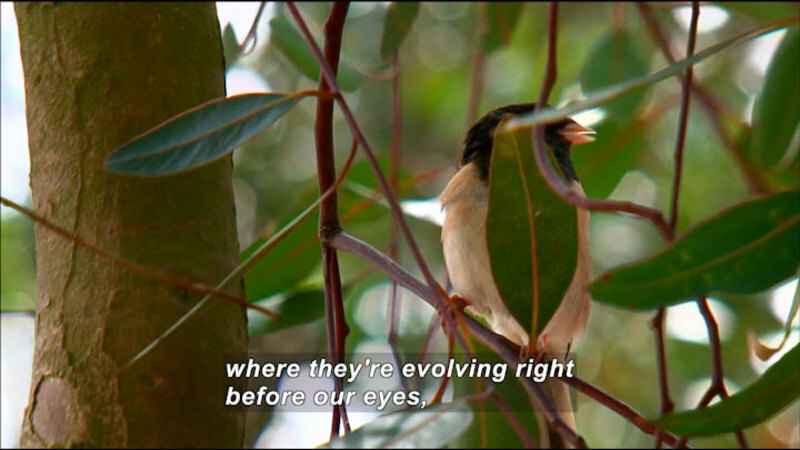 Evolution can happen right before our eyes in response to new and changing environments. (male) Especially in an area like San Diego, where we've seen revolutionary change. We can study what's around us and right in our own backyard, so to speak. Evolution isn't something that happened a long time ago, it's something that happens every day. 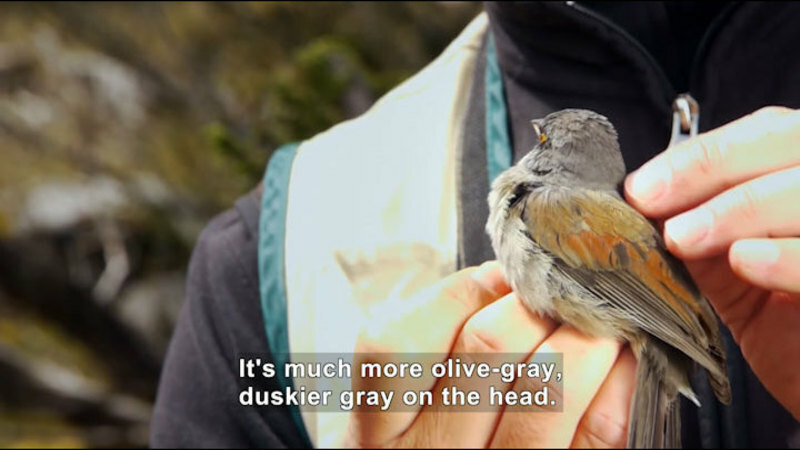 In contrast to the peaceful wildlands featured in the prior segments, the urban campus of the University of California-San Diego (UCSD) seems like an unlikely place to find field biologists studying juncos. But in the early 1980s, some juncos decided to make this atypical urban and coastal habitat their year-round home. 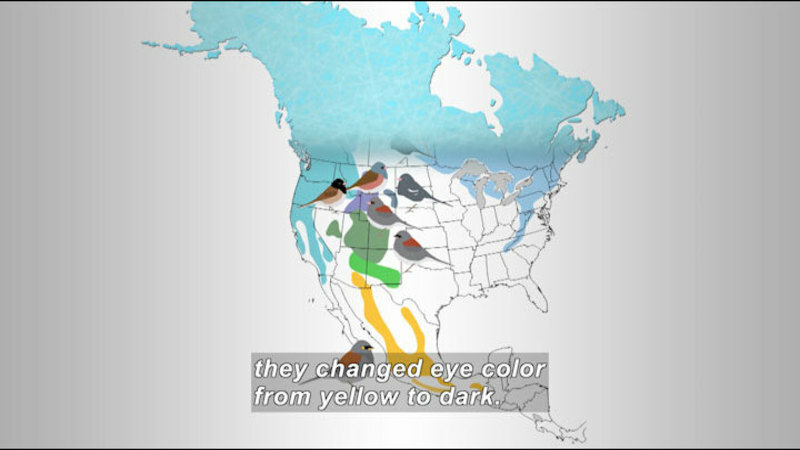 Since then, scientists have documented a remarkable array of changes in the physical traits, behaviors, and physiology of the colonist population of juncos at UCSD when compared to juncos from the nearby native range. Part of Ordinary Extraordinary Junco (Chapter 6).